A good boat, well prepared, and the sublime anchorages are yours! First of all, it’s a good idea to remember our chief editor’s favorite saying: ‘the right boat is the one you set off in!’ And we have to admit, the boss is not (never?) wrong... 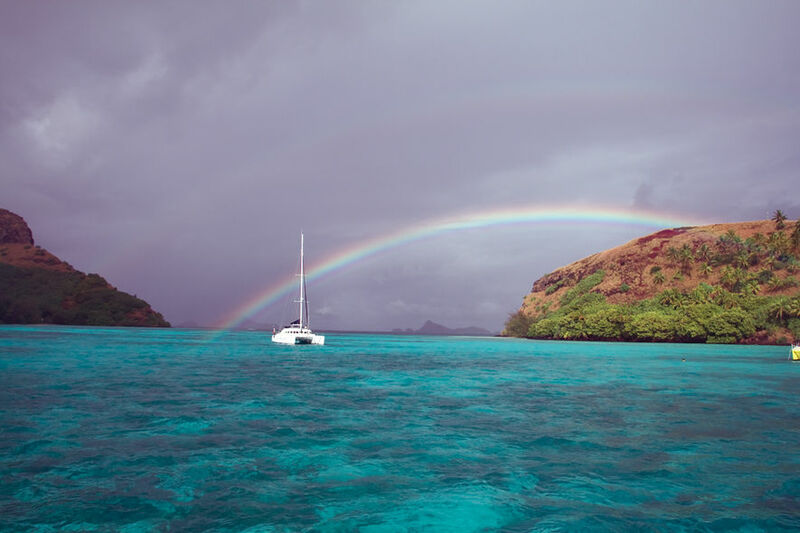 The proof: many of the magazine’s readers set off each year in a variety of different multihulls, trimarans with not much more accommodation than a monohull, ex-charter catamarans, amateur-built boats or even superb private owner’s boats of over 60 feet... There really is something to suit all tastes and all budgets. To convince yourself, all you have to do is read our ‘Postcards’ column regularly. The choice of boat will therefore be dictated by your budget and your personal motivations concerning the essential questions of comfort/performance ratio (on this subject, see the Multihulls Match in this edition of Multihulls World - an instructive article about each person’s choices!). Once the choice of boat has been confirmed, you will have to turn it into an ocean cruiser. And if you want your cruise to go smoothly, there are a few rules to be respected. A blue-water cruising boat must be reliable...to sail far! The n°1 aim of preparation is to have a reliable boat! On a long-term cruising program in a boat (and even more so on a sabbatical year), we dream of idyllic anchorages, not spending three weeks in a port waiting for a new windlass to replace the one that has broken... And although d-i-y and maintenance are part of the ‘day’s work’ for a long-term cruiser, it is best to avoid spending two hours every day fettling the starboard engine, which obstinately refuses to start. It’s very bad for the crew’s morale! The cruiser’s n°1 rule: reliability is inversely proportional to the amount of equipment embarked aboard! The first thing to do when preparing a blue-water cruising boat is therefore to list the equipment you REALLY need. Although no one today would seriously envisage doing without a GPS, or cartography on a computer, what about the dishwasher, or the tumble dryer for a Caribbean program? And what can we say about the air-conditioning, which can be very pleasant in harbor, but which is absolutely not essential at anchor, if the boat is well-ventilated? We could find an infinite number of these examples. It’s up to each person to make their choices, according to their wishes and their boat, not forgetting that in a multihull (of any sort) weight is the enemy, and living aboard a boat does not offer the same comforts as at home... Any error of judgment at this level will lead to a very expensive (to buy and to maintain) and/or very unreliable boat! It is essential to haul out your ocean cruiser - for the overhaul of the engines and saildrives, as well as to prepare the hull properly. 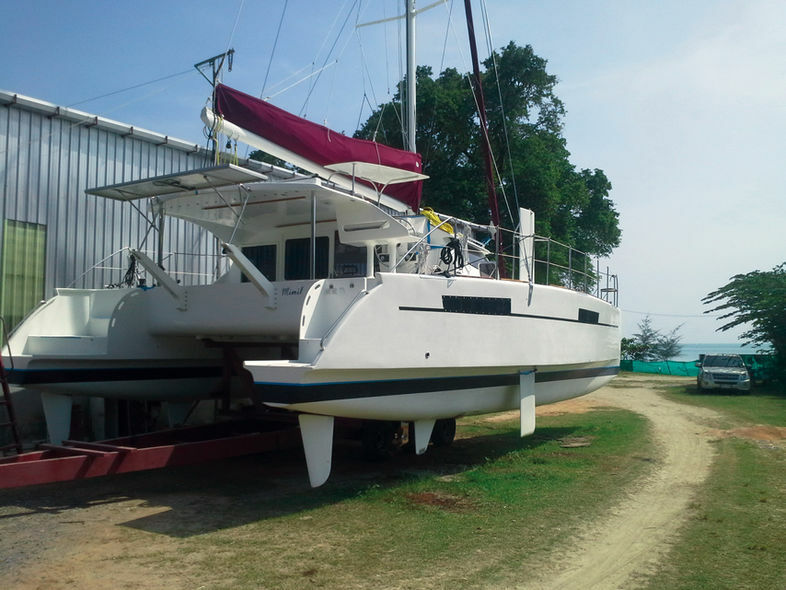 You want to live for a year aboard your catamaran, with your family? That’s great, but if you want to avoid marinas – expensive and to be honest, unpleasant - you will have to work on your boat’s independence.